It’s Tax Day. 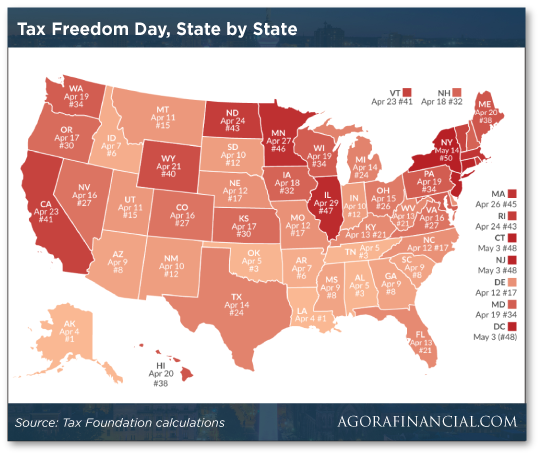 And Thursday is Tax Freedom Day — well, the national average anyway. That’s federal, state and local. Tax Freedom Day falls three days earlier this year compared with last year — thanks mostly to the new federal tax law. Granted, your mileage may vary depending on where you live. 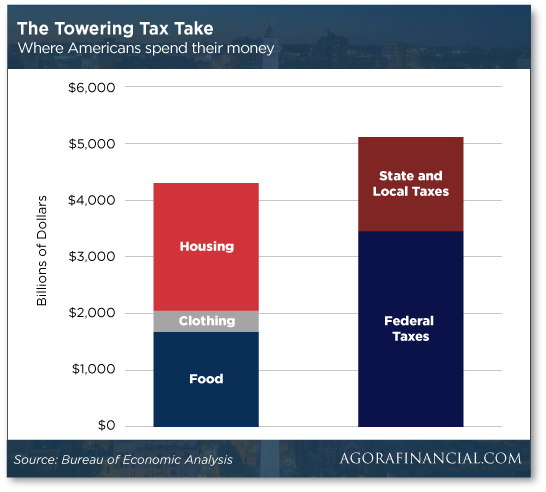 One caveat: These calculations don’t account for Uncle Sam’s deficit spending. It turns out a handful of corporations — including Amazon — have gamed the system such that for them, there’s no such thing as Tax Freedom Day. Instead, they collect money Uncle Sam first took from you and me. For real. The Institute on Taxation and Economic Policy ran the numbers on most of the Fortune 500 companies and found 15 of them have a “negative” Tax Freedom Day. ITEP says the “disclosures made by these companies are too vague to allow a complete diagnosis of how they are avoiding income taxes”… but the group still managed to suss out a thing or two. For instance, Amazon (AMZN) collected a $137 million rebate — good for an effective tax rate of minus 2.5% — by seizing on a tax break that lets companies write off the value of executive stock options. Other companies named in the report include Duke Energy, Prudential, Molson Coors and Dish Network. As long as we have Amazon on the brain, let’s talk about the sales tax case before the Supreme Court today. Perhaps you saw the news: The justices are hearing arguments in a case that could end up with millions of small-time online businesses required to collect sales tax. We first told you about the case nearly two years ago, long before the justices agreed to take it on. In essence, they’re looking at a do-over of their 1992 Quill decision. In that pre-web case governing mail-order catalog sales, the court ruled that a business is required to collect sales tax only in those jurisdictions where it has a physical “nexus” — a retail store, a warehouse, etc. A while back, lawmakers in South Dakota enacted an online sales-tax law with an eye toward generating a test case that would get Quill re-heard. They got their case from the home-goods website Wayfair, which objected to collecting sales tax from its South Dakota customers. In all likelihood, the justices will rule in South Dakota’s favor by the end of June. As the dominant online retailer, Amazon’s position on sales tax has — uhhh — evolved over time. It was on the back of the Quill decision that Amazon was able to make enormous inroads in retail. If you knew what books you wanted to buy and you were willing to wait a few days, why go to the trouble of schlepping down to Borders — and paying sales tax to boot? But Amazon changed its tune over the years. As it opened more warehouses and distribution centers to ensure speedier delivery, it ended up charging sales tax in more and more states. By last year, it was charging sales tax in every state that imposes it — although for now it still skirts most local sales taxes. So weep not for Amazon if Quill is overturned. But for 4.1 million small businesses that sell online, it’s a different story. “If the Supreme Court rules for South Dakota in this critical case, it will do real damage to the growth opportunities of small retail businesses and the more than 15 million people they employ,” writes Marie Oh Huber at The Hill. Ms. Huber is general counsel for eBay — whose platform is used by many of those small retailers. Ms. Oh Huber cites the case of a South Carolina company that dismantles old boats and ships and recycles the parts. By expanding its physical presence to cyberspace, the firm was able to generate an extra $60,000 in income each year. But annual compliance costs if Quill is overturned could total $50,000. Well, yes and no. Amazon developed such software years ago. As we pointed out at the time, Amazon was not going to do this out of the goodness of its heart. No, Amazon was going to make money from it. AMZN already does from some of its “Marketplace Professional” third-party sellers. For now, Amazon still doesn’t collect sales tax for most of its third-party sellers. But once Quill is overturned, Amazon will be ready. More online small businesses will decide they have no choice but to be assimilated by the Amazon Borg. And of course, consumers will be paying sales tax on far more of the items they buy online. Gold is holding steady at $1,344 an ounce. Crude is off a bit, but still above $66 a barrel. Economic numbers abound today: Housing starts for March rang in strong… and so did permits, which are a better indicator of future activity. That said, all the strength is in apartments and condos. The trend in single-family homes, at least for now, is down. Industrial production jumped 0.5% for March, but within that number was a disappointment: Manufacturing production grew only 0.1%. Still, the capacity-utilization number is now the highest in three years: 78% of the nation’s industrial capacity was in use during March. Netflix is up 9% on the day to an all-time high — continuing its run as the best-performing of the so-called FAANG stocks this year. We love how Wall Street “professionals” react to Netflix’s numbers. They don’t emphasize earnings. They emphasize the number of new subscribers. It’s not quite as bad as the dot-com era when we were told profits didn’t matter as much as “clicks” — but the parallels are unmistakable. At least Netflix has profits — on paper. But it also sports a P/E ratio of 269 — even higher than Amazon’s lofty 241. Then again, how real are those profits? Allow us to go off on a tangent for a few moments. There’s a website called “Crazy Days and Nights” where anonymous submitters dish on celebrities. Mostly they’re “blind” items, in which you have to read between the lines to figure out who the submitter is talking about — although oftentimes it’s not too hard. Readers of the website were hip to the scandals surrounding Harvey Weinstein and Kevin Spacey long before they became headline news. The post alludes to “accounting magic” that “allows the company to claim that it is generating a ‘profit.’ The reality is that this company burned through about $2 billion of cash last year and will burn through another $3–4 billion in 2018. There’s no other company the post could possibly be talking about. The “accounting magic” is well-known to the handful of analysts willing to look past the slick song and dance. And it reminds us of the case against Uber we described here last year — an enterprise that succeeds only because (and only as long as) investors are still willing to pour money into it. Granted, Uber hasn’t gone public yet, but the logic is the same. For the record, no Agora Financial editor — a diverse group of both bulls and bears for sure — currently recommends NFLX. P.S. Patience pays off: Back on April 2, Alan Knuckman recommended call options on Intel in his Weekly Wealth Alert premium service. Later that day, Bloomberg reported that Apple was going to cease using Intel chips to make its Macs — a devastating rumor for INTC shares that day. But the rumor is still unconfirmed, and INTC has since recovered. Fast-forward only 15 days to today… and Alan recommended selling that position. Once the order is filled, it’ll be good for a 49% gain. Alan’s next recommendation is due next Monday. It might not be for the faint of heart… but the payoff potential is huge, and it could all happen within the space of 10 trading days. See for yourself at this link.